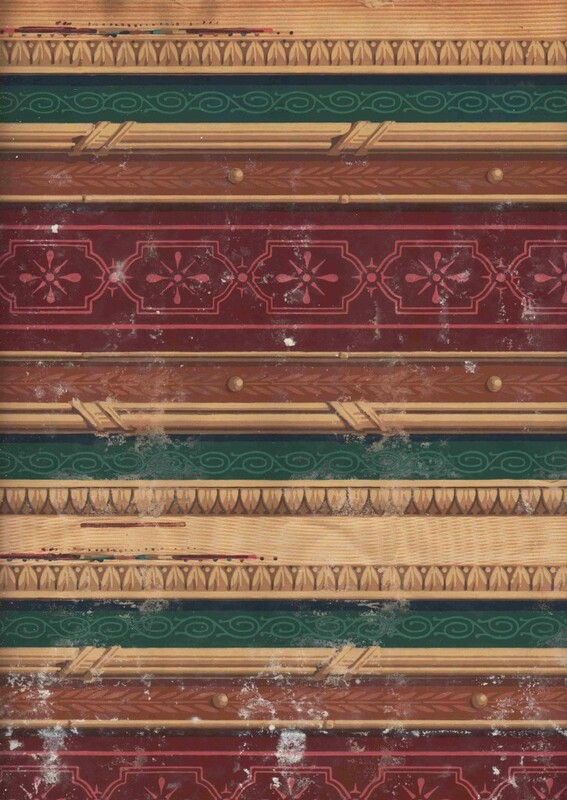 It started with a skip – the Marks collection and the Fota Wallpaper Archive. While passing along Dublin’s South Anne Street one afternoon in 1976, Desmond Guinness noticed some men at work emptying the premises of John Marks Decorators. Peering into the skip (or dumpster for American readers) which had been placed in front of the shop, he saw dozens of rolls of wallpaper – not the machine-printed vinyls then in vogue, but block-printed patterns highlighted with gilding and flock, evidently of some antiquity. Following a brief discussion between the observant passer-by and the foreman of the crew, the rolls made their way out of the skip and into Leixlip Castle, and were thus fortuitously preserved. The ‘Marks Collection’ now forms a major part of the Irish Heritage Trust’s archive of historic wallpapers, housed in Fota House and dedicated to the memory of Ada Longfield, who – in a lifetime of research and publication which began in the 1930s and continued into the 1970s- did more than anyone to trace the history of printing on wallpaper, cotton and linen in Ireland in the long eighteenth century. 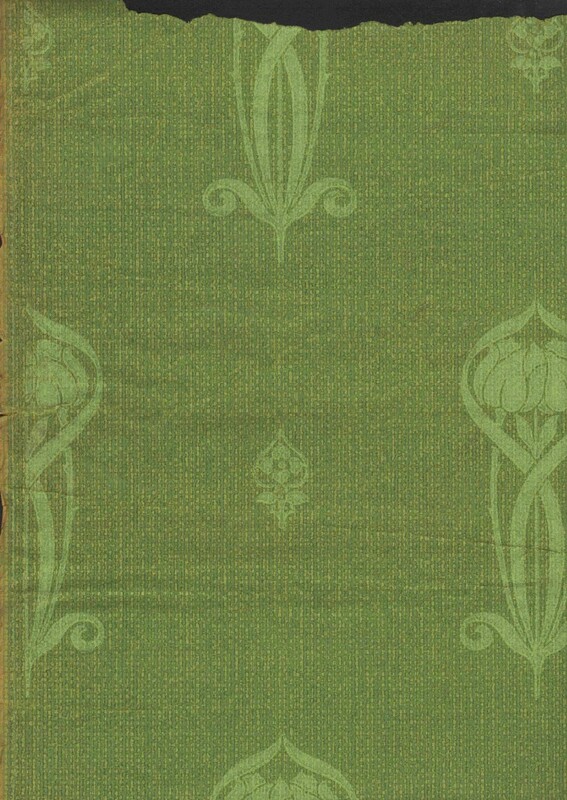 The existence of the archive is due largely to the efforts of John O’Connell, whose own collection of historic papers salvaged from Irish houses also forms a significant part of the archive, and includes such rare and valuable examples as the early eighteenth-century flock paper from Turvey House and the complete room of imported Chinese paper of 1800 from Killeen Castle. The latter was briefly installed in a bedroom at Fota in 1988, but sadly was taken down at a time when the future of Fota seemed uncertain, and has remained in storage since. Several examples of the products of Ireland’s many ‘paper-stainers’ are in the collection, identifiable by the stamps used on the reverse to show that the maker had paid the duty which was levied on wallpaper in Ireland between 1796 and 1836. These duty stamps were a favourite subject of Ada Longfield, who published several lengthy articles on them – indeed it is probably no exaggeration to say that she was more interested in the stamps on the back of a wallpaper then the pattern on the front. The firm of Marks traded on South Anne Street for almost exactly a century, and the material salvaged from their store room represents the best of what was available at the upper end of the wallpaper market in mid- to late-Victorian and Edwardian Dublin. The bulk consists of borders, friezes and corner pieces, many of which exemplify the heavily enriched and opulent style of the ‘beaux arts’ school of design. Victorian avant-garde or reformist styles are noticeably absent – no specimens of the work of William Morris, Walter Crane, Owen Jones are included, and only a few items reflect the flattened, two-dimensional forms advocated by the design reformers. On the contrary, illusionistic and mimetic effects appear frequently, including a number of faux-bois pilasters, capitals and friezes. 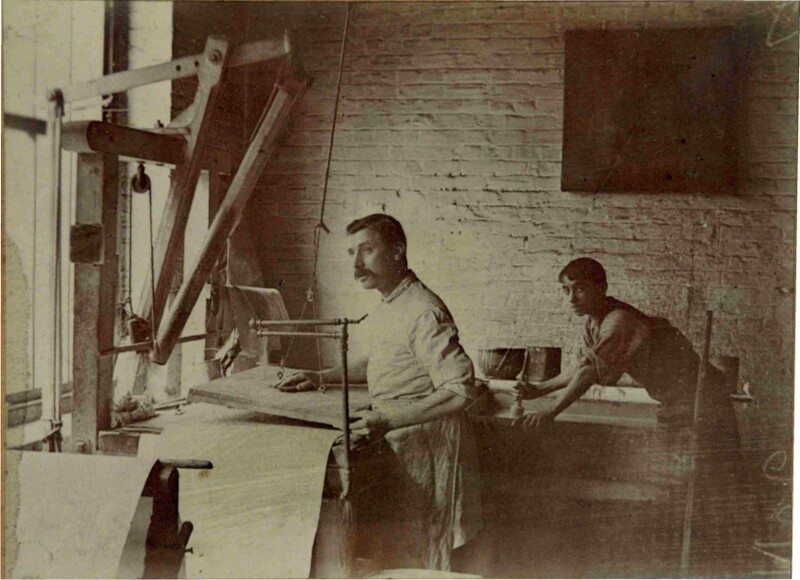 These are splendid examples of the skilled block-printer’s art – one imagines them being made by proudly-moustachioed men such as this unnamed printer in a London factory, photographed around 1910. 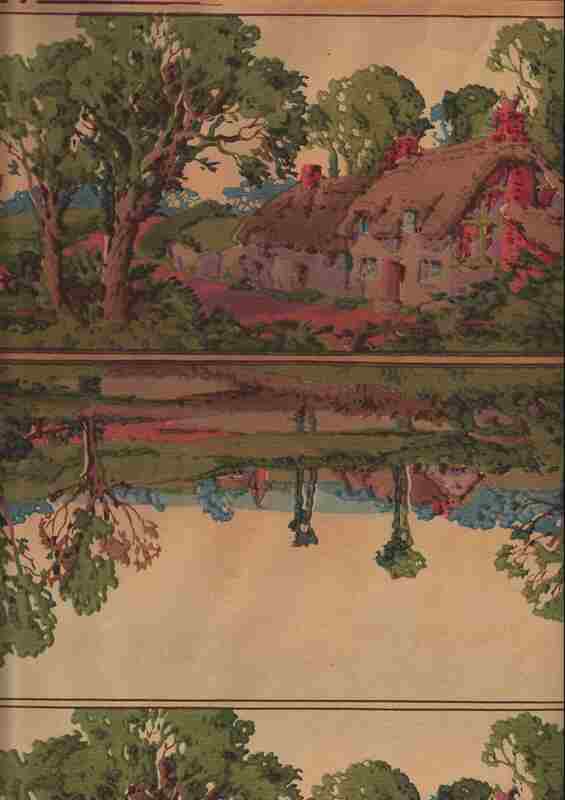 The collection also includes some early twentieth-century patterns which reflect the influence of art nouveau, while other examples – such as the pictorial frieze shown here – suggest that by that time the firm’s clientele had moved slightly downmarket. 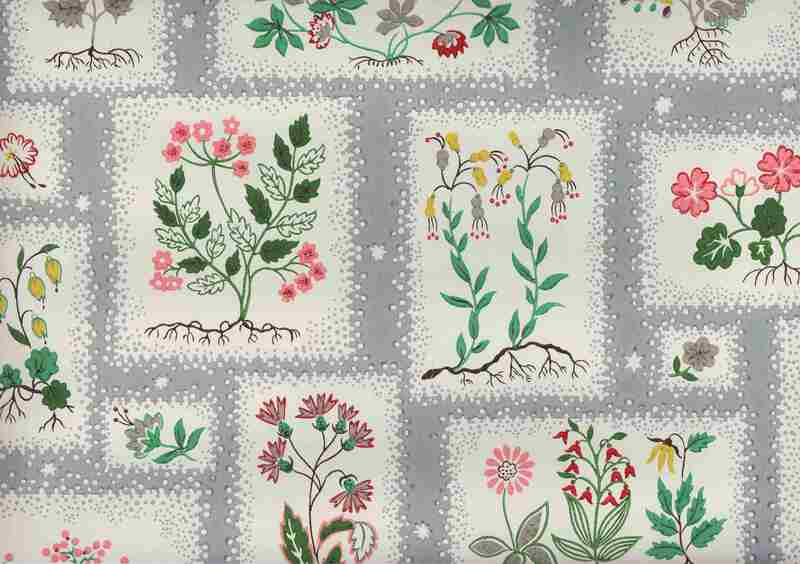 From slightly later, two examples of the ‘Lancastria’ range of wallpapers made by Wallpaper Manufacturers Ltd show the cheerful and colourful styles available in the 1950s. 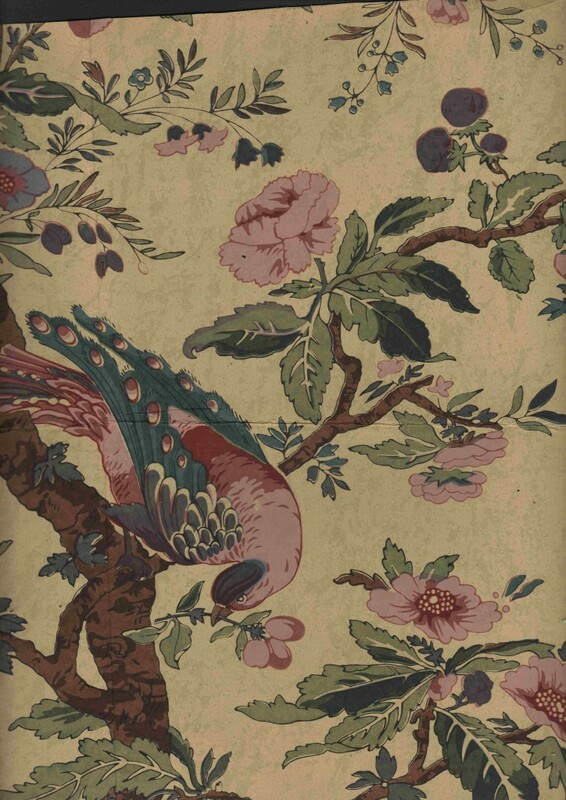 The Fota Archive is a small collection, yet manages to convey a good impression of the development of fashion in wallpapers across three centuries, while preserving for future study and enjoyment significant examples from Irish houses, many of them the product of local artisans. 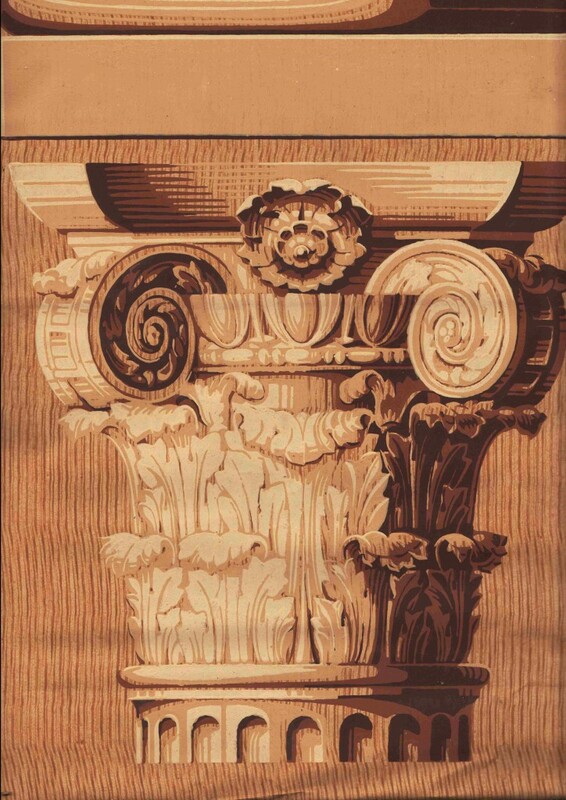 It is a resource that will – it is hoped – be appreciated and used by all those interested in the patterns of the past, be they students, design professionals, historians or architects. I was searching your site, looking to see if Fota Shamrock was still available. 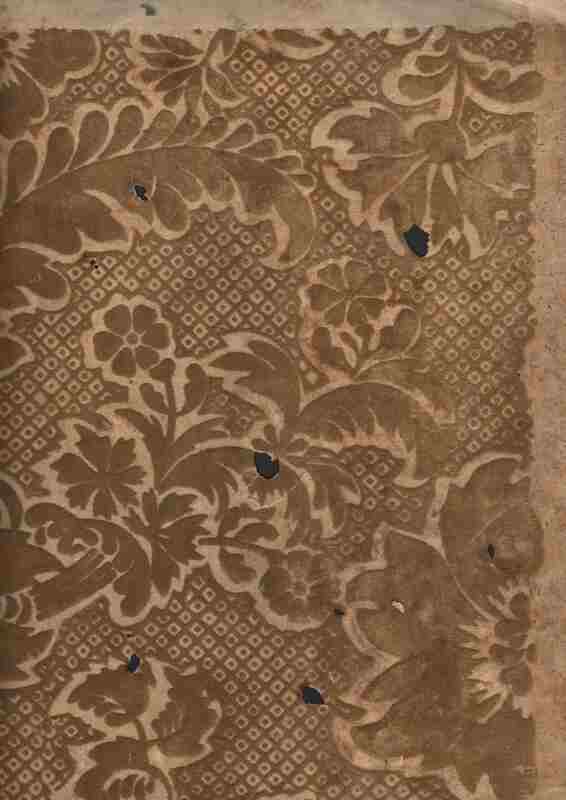 I am curious about this last image on this blog post: is this paper (that appears to be small vignettes of botanicals) available? Please advise! thank you for your time! Yes, the Fota Shamrock paper is still available – we make it regularly. The paper you mention from the Fota Archive is not part of our range, and I am fairly sure it is not available from any other manufacturer. I have a feeling it was made by Lightbown Aspinall in the 1950s as part of their Palladio range – fabulous patterns, many of them designed by leading artists. Found this above a suspended ceiling in house I’m currently renovating. Any ideas re age or maker.